Collecting an entire SCM Original Card set would be crazy, to put it plainly. 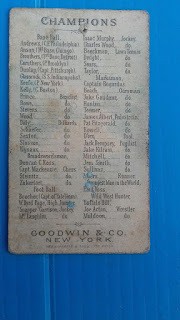 Looking at the SCM Insert Checklist, there are 397 numbered cards, plus many unnumbered ones early in the magazine's history. Many are relatively easy to obtain, though sometimes at prices that are nonsensical. And then there are the difficult ones. I'm working on a subset, essentially, as many cards feature women's sports. I still come across cards that I missed for whatever reason, but most importantly there are still four more cards that I have yet to see that I know I want. And while looking at that checklist, it seems that either my collection is missing a bunch of recent cards (doubtful) or they just weren't inventoried (hopefully). So when I'm home again this weekend I'll have to check... I might need a couple magazines' worth of SCM promos! Collecting a player like Jose Altuve has gotten quite challenging. Now that he's one of the bigger stars in the game, he shows up in all kinds of insert sets and all of Topps' online nonsense. So of course he's in the Topps Now World Series Champions set! Here he is on his own card. I do like that there is a little bit on the back about how he did in the series, but they could have tossed on a game-by-game statistics chart. It's not that hard - cut and paste, Topps. Cut and paste. And Jose has shown up on so many multi-player cards now that I can't keep track of them. But going back to my pun in the title, why doesn't Altuve wear the number 2 jersey? I'm glad to have these cards anyway! Now that the season is getting underway, hopefully I can make it to a few games this season. I got to three NPB games and three Shikoku Island League games last year, so perhaps I can match that in quantity, and hopefully quality! Wait, what's that? Not your ordinary Topps parallel, is it? This is a Transcendence VIP Party 1/1 stamped with the 2017 All-Star Game logo. And while some cards apparently aren't actually 1/1, this seems to not be on that list. And that might remain my only card from a Transcendence release for a long time. This is one of the cards given away at the party in so-called "Silver Packs". Other than the foil stamping on the front, it's the same as any other regular Topps card. But it's still cool to have a card that ultimately came from a $25,000 pack. Eight mascot cards. One team, the Wyverns, didn't have a mascot card. Nine team cards, featuring photos of each team on the field. While I don't plan on collecting any major KBO sets in their entirety, I'm happy to have these cards which represent all of the teams in KBO as part of my collection. I normally wouldn't want subsets like these but for one issue it's great to have! There were two more type cards from SMG/Ntreev in the package along with the subsets. This single is from the "Clear Card" subset from the third Baseball's Best Players set, Forever Ace. Despite its name, the card itself isn't clear. But this one is, from the first series. Baseball's Best Players: Hell's Fireball had actual clear cards, and you can see the backs are completely blank. Sure, acetate is gimmicky, but I like it! Thanks Dan for some great cards! I'm glad you got your package, too! There is no typo in my post's title. All of these cards feature that Fighters player you haven't heard of. While Shohei Ohtani has been all over the sports pages, Sho Nakata has been all over my mailbox. Well, just in one package. It's always nice to get some English on a card to identify where it's from. The Fighters had a bunch of turn-back-the-clock events in 2017, which tehy called Legend Series. This card represents the Flyers era. I believe this is the same series where they also gave away replica retro jerseys. I love the retro menko-style design! I already have samples from this release. In 2011 the Fighters released a series of bromide-sized cards, and it was popular enough that I've seen singles at a few card shops around Japan. The card number is in the lower-right corner. There's also a foil signature version, obviously not paralleled as it has a different photo and the card number is different (SP.05 here). My scanner doesn't like black and white images. Or perhaps it can't handle black and white images printed using color inks, as this probably was. Anyway, this is a Japan Post-issued postcard. Collaborations are big in Japan, and the postal service isn't afraid to capitalize on popular culture. I'm happy to add these to my collection, especially the Legend Series bromide. Hopefully I'll find more of the Legend Series in my travels. This lovely card marks the completion of another of this year's goals. The goal was to have every Topps flagship regular (non-subset) Nolan Ryan card from 1972 through 1994. I picked up the 1973 and 1974 cards at the end of December, and the 1975 single in mid-January. 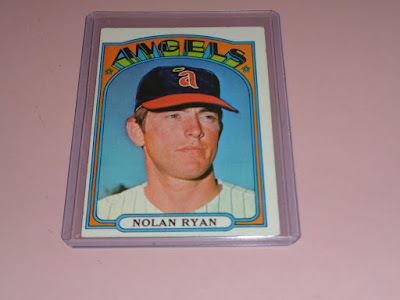 I finally tracked down an affordable copy in decent-enough shape from the 1972 set, and now I'm much closer to completing a full run of Ryan's Topps cards. Of course, what I've paid for all the cards from 1972 to 1994 will probably be less than the 1968 rookie card. Let's see if I can get the 1969, 1970, and 1971 cards in the bag by the end of the year! One of my goals for the year is to knock out the "base" cards in my type collection. It sounds easy, but most of what is left comes from super-old vintage sets - sets which were fairly big releases in their time but have been lost over the years. Granted, some of the cards on that list weren't really major issues, and I'll be adjusting my lists as appropriate, but there are still plenty of cards to chase after. 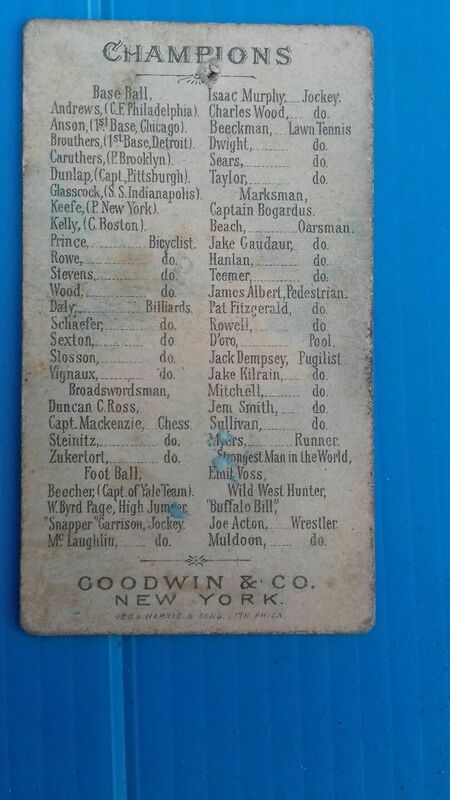 One of those cards is no longer the original 1888 Goodwin Champions multi-sport set. Let's face it. Getting actual baseball cards from these sets is generally going to be out of my price range. 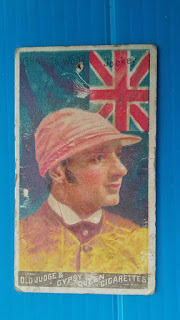 But thankfully there are jockeys, like Charles Wood, in the set. And they have lots of pin holes in their cards. So they're much more affordable. And honestly, if you follow this blog enough, you know I like oddball sports in regular releases, just like the current and original Goodwin Champions sets. So it may not be a baseball player, but it's a great card to have in my type collection! Completed Set: 2012 Calbee "Evangelion Chips"
1/1, Japan 1/1, and x/x! Seven Days Without A Post Makes One Weak.. Week?